So here's the post that you've been (im)patiently waiting for--my pilgrimage, if only one timezone over, to one of the most innovative, original, and inspiring restaurants in North America: Chef Grant Achatz's Alinea. Originally, I had planned to take my mom here as a Mother's Day gift back in June, when I had my annual visit to Chicago to visit my kai family (Cantonese equivalent for "godfamily" whom includes my mom's best friend, her husband, and their daughter), but a family emergency came up which required my mom stay back on the East Coast to help out. Unfortunately, I had to cancel the reservation for the two of us, which left an open ticket to Chicago for my mom to use within the next year. I kept mulling over when I'd be able to sit down and dine at Chef Achatz's culinary laboratory, because it had seemed at the time that I was so close (being able to actually book a reservation in June) yet so far away (the East Coast isn't exactly neighbors with the Mid-West). Then I thought of a great idea--Kai Ma (as I've introduced her in my post for her birthday) had her 50th birthday coming up in October (on 10.10.10, no less! 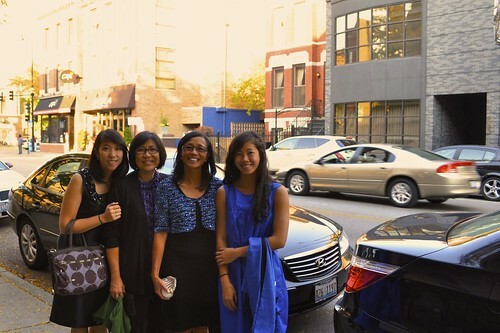 ), so I was thinking my mom and I could come visit her for her birthday weekend as well as take her to Alinea to celebrate the milestone birthday along with Kai Yeh (my godfather) and Laura (my godsister). Once Kai Ma confirmed that the three of them were "in" for this birthday dinner at Alinea, I added a reminder in my calendar so I'd know exactly when to call the restaurant, in hopes of scoring a reservation for a party of five with no issues (boy, did I ever underestimate that)! I made sure the reservation policy (i.e., all reservations for a desired month are open to the public on the date of the 1st, two months prior) didn't change from since the last time I had called (i.e., if I wanted any reservation for a date in October, I would have to call on the first of August). With some minor delays and date-to-begin-calling changes on part of the restaurant, August 16 finally rolled around, and I was desperately staring at my watch, waiting for it to turn 11 AM (Alinea's front desk opens at 10 AM, Central Time) and exhibiting intense symptoms of RLS (i.e., Restless Leg Syndrome). I took this phone call very seriously--I had synchronized my watch down to the second and had preset the restaurant's number on my cell, so that all I would need to do is press Send to dial away. I was more than ready (or so I thought). Thoroughly convinced that I wouldn't even need to cross my fingers as my meticulous planning would yield me a much-desired, hassle-free reservation for a party of five, I have to admit in hindsight that this minor hubris on my part will have cost me forty-five minutes of my life I'll never get back. Then, it turned 11, and without a flinch, I pressed send. Busy signal. I tried again. *Neer-neer-neer* All circuits are busy. Please try again later. Panic mode commenced. There were no other alternatives, no Plan "B". I had my heart totally set on Alinea--how could I substitute another gastronomic destination after having spent so many moments dreaming and drooling over the Alinea cookbook, the result of Chef Achatz's culinary ingenuity? But at 11:44, just as my heart was about to sink, it was no longer a busy signal or an "all circuits are busy" message. It was actually ringing! To think that constantly pressing redial over and over for the course of several failed phoning attempts would have me nearly forget what a dialing signal sounds like! The mâitre d' answered, but before I could respond with all of the necessary information for a reservation, the internal hysteria had only then began to wind down, as I was gasping into the receiver, totally out of breath. To my dismay, as I started to regain composure, there were no tables remaining for five. I could feel my heart sinking again. I asked her if there were any tables left at all, and the mâitre d' informed me of an open table of four at 5 PM, offering me a spot on the wait list for any cancellations that would allow for a party of five. I guessed I had to take what I could get, after having tried to get through to the restaurant for that long. Without a moment to lose, I was the lucky reservation holder for a party of four at Alinea on Saturday, October 9 (which I dub to be Fortuitous Omen #1, as the Chinese like to celebrate birthdays on or before the actual birth date). So excited that I'd finally be going to there at all, I even considered lugging Chef Achatz's Alinea cookbook all the way from New York to Chicago, all 6.6 pounds of it (random tidbit, courtesy of Amazon.com) for him to sign, but there is no guarantee (per the mâitre d' whom I asked) that he'll even be there, as he's constantly being called in and out of the kitchen for various things. So I opted not to risk having my suitcase blow the maximum weight that would result in a ridiculous penalty fee. I would very much rather put that money towards the meal that night. Thankfully, the Saturday morning of the dinner, I had received a call from Alinea, saying there was a party cancellation that would allow for us to have a table for five with no problems. Kai Ma was very ecstatic that the five of us would be able to embark on this wonderful culinary adventure together--birthday and all. I should've known this was Fortuitous Omen #2, indicative for great things to come that night! 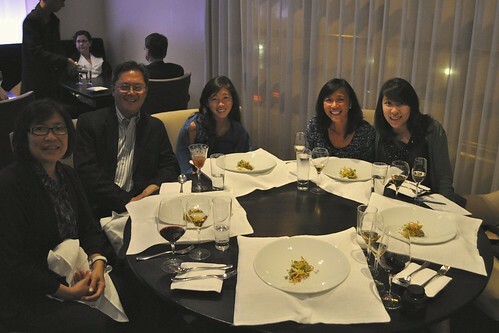 So I (on the left) finally made it to Alinea (pictured as the granite-colored building) with (to the right of me) my mom, Kai Ma, Laura, and Kai Yeh (not pictured here, as he's taking the photo for us). Before I made it to Alinea, I read the introduction to the Alinea cookbook to learn more about its chef and his origins. 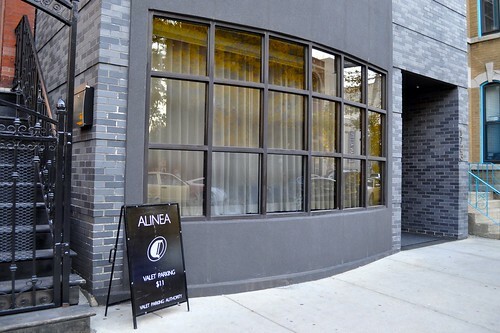 Located in the neighborhood of Lincoln Park of northern Chicago, Alinea is the home to Chef Grant Achatz and his explorations of classic flavors with a twist (it's how I see it, anyway). Since his graduation from the Culinary Institute of America, Chef Achatz had worked four years at The French Laundry (he sent his résumé every day to Chef Thomas Keller until he gave in and hired him), cooking his way up to become a sous chef. It was there he learned to recognize "food in an artistic away, in an individual expressionist way," where "constant creativity" slowly became a part of his mentality in the kitchen. He also trained under Chef Ferran Adrià, the father of "deconstructivist" cuisine, in his "kitchen laboratory" at elBulli--"a kitchen that is not a kitchen"--where he honed his inner creativity, giving him the confidence to begin exploring "new avenues in the kitchen." After The French Laundry, Chef Achatz left to become the executive chef of Trio in Evanston, Illinois (now closed), where he really got to fully develop his avant-garde, cutting edge cuisine. Here, he met Nick Kokonas, a Chicago businessman and a regular patron at Trio. He became so blown away by the chef and his food that Mr. Kokonas told the him that "if he ever wanted to open his own restaurant, maybe they could partner in some way." Three years later, Chef Achatz and Mr. Kokonas collaborated to build a restaurant where "invention, creativity, and surprise would drive the food." 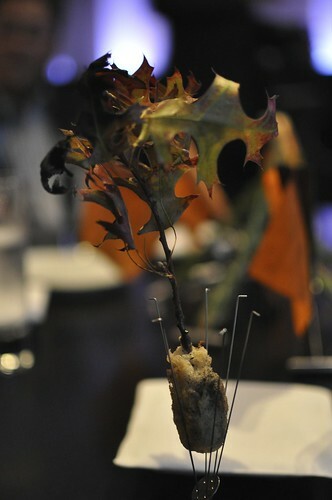 And so, Alinea was born and continues to thrive on the gastronomic bucket lists of foodies and beyond. Gourmet magazine named it the Best Restaurant in America back in 2006. Also, as of late, it was named one of the World's 50 Best Restaurants by S. Pellegrino (at #7) and subsequently as the Best Restaurant in North America (as it is the first North American restaurant appearing on the list). I guess that was enough background and history. Let's begin the journey through twenty-one courses. 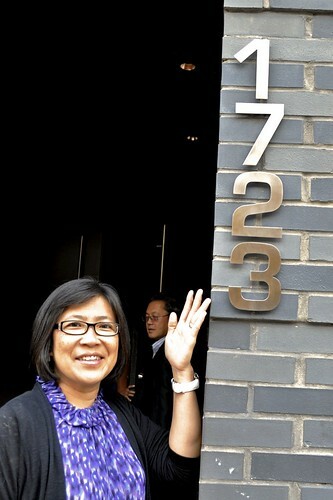 My mom showing off the restaurant's address, 1723 North Halsted! 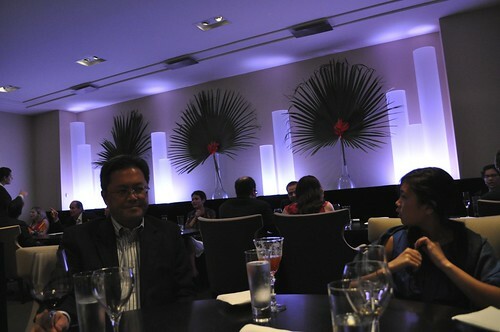 View of inside Alinea, upstairs from our round table (Fortuitous Omen #3). The Chinese prefer to dine at round tables because they seat more people and contain no sharp edges (typically bad feng shui). Also, round tables allow all diners to see each other (without differentiation of status, as well). 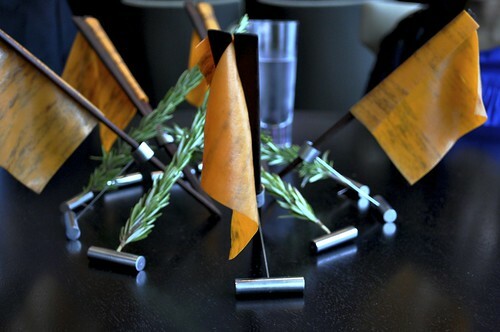 These were placed as "mystery centerpieces" (the "orange flags" and rosemary sticks)--we were told by our captain that they'd be incorporated in the course of our dinner later on. It'll surprise you as much as it did me. Details to follow later. 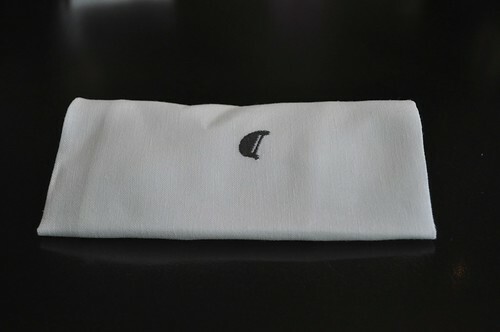 Napkins served at Alinea with its logo embroidered on them. This logo is actually an artistically-designed pilcro (¶), a symbol typically seen in editorial marks to denote individual paragraphs. A pilcro is sometimes called an alinea, and incidentally, the Latin root behind this word (and of course, the restaurant's name), a linea, means "off the line"--what Chef Achatz likes to call "the start of a new train of thought" (as he shared during his guest appearance on The Martha Stewart Show last week). I discovered this random tidbit after my visit, and I find it to completely heighten my understanding behind the chef's philosophy behind his restaurant and cuisine. Very beautiful. 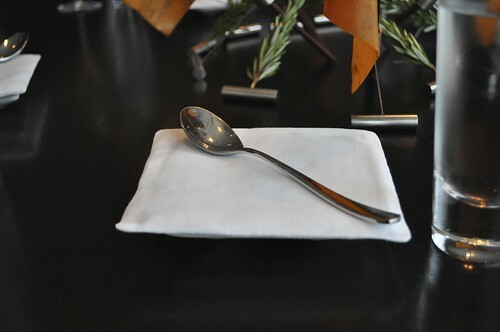 This served as our "flatware pillow" for all clean, unused flatware to be placed before its respective course. Additionally, this "pillow" is featured on the Alinea cookbook cover. Just before I delve into what you've all been waiting to drool over, I'd like to point out something about the structure of Chef Achatz's menus. The "title" of the course features its main ingredient--the focus of the entire dish. After each "title" (a snapshot of the menu will conclude this blog post), there are differently sized opaque circles, representing (relatively, of course) the size of the course at hand, followed by a catalog of the rest of the accompanying ingredients for each course. I've italicized each "course title" so you'll know what the main focus of each is. Our twenty-one course dinner began with three atypical cocktails. 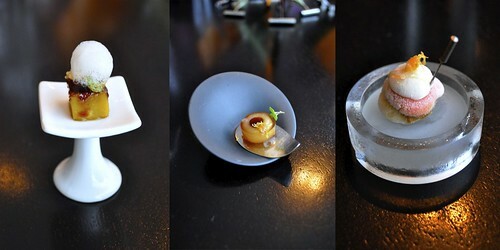 Presentation (not in liquid but solid form) was extraordinary, and the serving-ware used was really clever. The first (on the right) was lemon with Luxardo bitter, Luxardo amaro, and grapefruit. This was to be taken using the metal toothpick from the circular frozen block plate and placed wholly in our mouths. This was very refreshing--tasted very much like a frozen lemon drop cocktail--definitely my favorite of the three. The second (in the middle) was apple with Laird's apple brandy, grenadine, and thyme--an ode to the classic Jack Rose cocktail, which typically contains applejack (a concentrated hard cider), grenadine, and lemon/lime juice, but with a thyme twist (ha-ha to the rhyming of lime and thyme)! We "drank" this cocktail by removing the metal scoop from the little granite-colored plate/bowl. The apple brandy was very potent and bitter in flavor, so it wasn't something I was too crazy about, but I still really liked the idea behind it. The last cocktail (on the left) was squash with cynar, Carpano Antica, and 7-year flor de cana (seen as rum foam here), served on a pedestal, to be used as a champagne flute. This was also very bitter (probably because of the bitter apéritif nature of cynar and the strong flavors of the Carpano Antica vermouth), but the presentation was very lovely. Overall, I wasn't dissatisfied with the cocktails--they just weren't cocktails I would usually order from a cocktail menu. For Laura, as she is still in high school, was given "cocktails" sans the alcohol: for lemon, she was given frozen and chewy grapefruit; for apple, she was given cider, grenadine, and thyme; and for squash, she was given molasses, Carpano Antica, and sage. As such, the essence of the cocktail was maintained in a non-alcoholic form. She told me they were delicious. 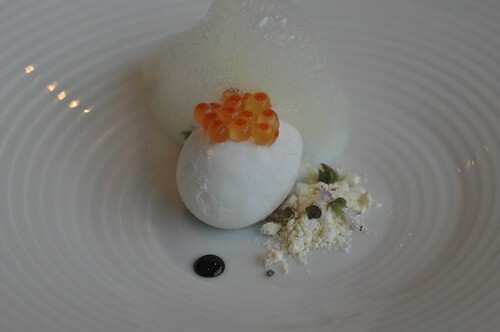 Our first "food" course was the Steelhead roe (the orange-colored rainbow trout eggs) with coconut (cubed and in frozen mousse-form), licorice (the black dot), and pineapple (dried as well as foam). The richness of the roe along with the sweetness of the coconut/pineapple and sharpness of the licorice went really well together. 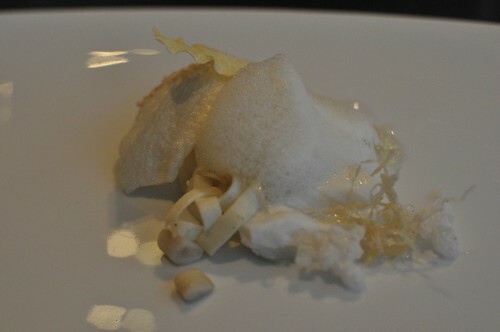 It was not just about the taste, though--the interplay of different textures and temperatures (the foam, the frozen mousse, the dried pineapple, the cubed coconut) was a nice surprise. Also, from an artistic standpoint, love the abstraction here. Absolutely beautiful--very avant-garde. This next course was chao tom with sugar cane (rectangular prism seen above), shrimp, and mint. As you'll probably notice throughout the entirety of this dinner, the waitstaff gave us very specific instructions for each course. Here, we were told that rectangular prism part of the hor d'oeuvre was there only for the juice, so we had to put the entire thing in our mouths, bite/chew/slurp in the juice from the sugar cane stalk to get the full flavor of the sugar cane mixed in with the shrimp and mint, and spit out the remnant of the cane. Definitely a Vietnamese-inspired dish (as you can see from the origin of the dish name)--very strong flavors from the mint and sugar cane. 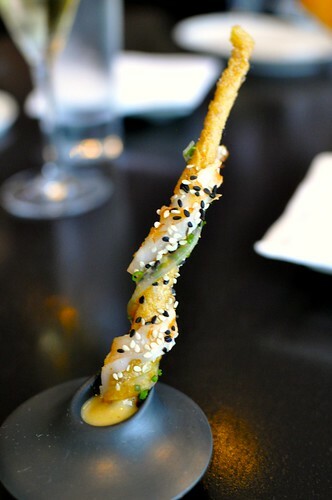 Served alongside with the chao tom, this dish was the yuba (i.e., Japanese tofu skin known as dried bean curd) with an interesting combination of shrimp, miso, and togarashi (Japanese seasoning). It was served in this granite flat vase-like item with a creamy spicy sauce, most likely seasoned with shichimi togarashi (the seasoning's full name)--a typical Japanese spice mixture containing seven ingredients: coarsely ground red chili pepper (main ingredient), ground Sichuan pepper, roasted orange peel, white and black sesame seeds, hemp seed, ground ginger, and nori (dried seaweed--the kind used in sushi rolls). As you can see, the long branch-like item is made from yuba. Wrapped around it is the shrimp (thinly sliced) seasoned with white and black sesame seeds (indicative of the shichimi togarashi seasoning). I loved the crunch of the yuba (integrity of the main ingredient was still in tact even with the moistness from the shrimp and the creamy sauce at the end within the serving dish) and the chilliness of the shrimp with the spicy Japanese seasoning. I could also taste the subtle use of miso in there as well. These two Asian-inspired dishes were very well-executed for a restaurant classified as New American (which I tend to disagree with--after having eaten at here, I certainly find its cuisine to not be of singular classification, but of embracing many of the world's cuisines). This was probably on everyone's top favorite that night. It involved both our taste buds and our sense of smell (I was going to throw in olfaction, but I don't want to sound too pretentious, haha). This was the maitake with root vegetables (carrots and brussel sprouts), chestnut custard with lentils, and "autumnal vapor". 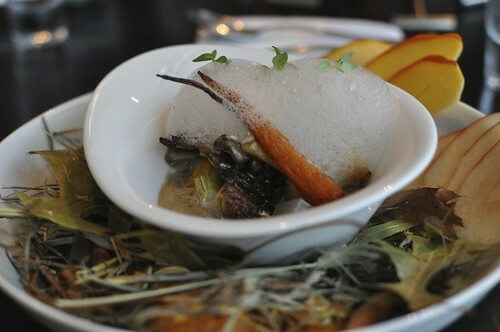 The "autumnal vapor" was created by pouring hot water into the lower bowl, atop the apples, cinnamon, hay, and pumpkin (seeds intact), exuding the redolence of fall's harvest or a "hayride" per Chef Achatz. Maitake (Japanese for "dancing mushroom") is a polypore mushroom that grows in clusters at the base of trees, typically oaks. After having read this, I understand why the chef plated this dish the way it appears above. As maitake is found at the base of trees, the chef is, in essence, reverting the mushroom back to its natural environment (with hay, fallen apples, pumpkins, and cinnamon) as close as possible on a dinner plate. Ingenius! The maitake was very tender and flavorful (as it seemed to have this super-concentrated taste of several mushrooms), even more so enhanced by the vapor. The root vegetables and chestnut custard lentils were great, too. All of the hearty flavors of fall found in this almost soup-like vegetable stew. Back to basics--love it! 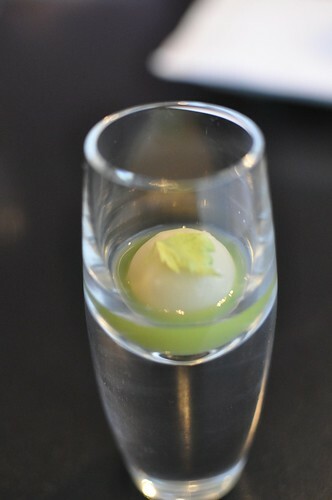 The next course was apple with horseradish and celery, served in a vase-shaped shot glass with a small leaf atop. "Open wide and close quickly," they urged (i.e., take it like a "shot"). "Everything must go inside the mouth all at once." I complied, doing exactly so--the orb fell into my mouth, surrounded by the celery juice (the green liquid seen above). Before I could realize what to do next, the orb shell exploded (probably from the heat and moisture inside my mouth) with a boom of flavors. A refreshing rush of sweet apple juice spilled forth, followed by the mellow biting zing from the orb's shell, which was made using horseradish. The unlikely combination of the three worked quite well, making for a nice segue between hor d'oeurves and/or starter dishes described above. Our captain introduced this dish as the chef's monochromatic dish (as witnessed above), for which the main ingredient is halibut, served with razor clams, black pepper, vanilla, and lemon. I love the concept behind this dish--limiting the ingredients to one shade of color while creating something that plates well and tastes great. The halibut was cooked well, still tender on the inside, and the razor clams were my favorite part of this dish. Easy to eat and not very chewy -- and it had a nice, peppery seasoning. My favorite photographed course that night (I've been in dire need of practicing my DSLR focusing skills): the pheasant with green grape, walnut, and "burning leaves". Instructed to be eaten in one bite (sans leaves, of course), the pheasant was to collapse as it was eaten. The "burning leaves" portion of this meal consisted of the leaves being blow torched in the kitchen, to effect childhood memories during the fall season. Very intense, sensory-wise. Also, this was my first meal consisting of pheasant, and the overall taste was nutty and reminded me fondly of duck. The batter used was light (the technique used is similar to the way the Japanese make tempura, by mixing the batter with soda water), and its result--crunchy. The presentation here was also stellar, making for another unique way of plating. Also, part of a pheasant's diet consists of leaves, so that fits in well here, too. Another top favorite of the night as well as the most "interactive" course: the short rib. We were instructed to remove the glass (which had on it the olive, blackberry, sweet potato, garlic, and cherry to be used later as part of the dish) from the wood (see "1") and place it in front of it (see "2"). Below the glass (as seen in "2") is a pair of odd metal prongs sitting inside the wood that we were told to remove (see "2"). Where was the short rib--the main protein of the dish--you ask? A very curious question, indeed. Once removing the metal prongs, we linked them together (see "3") and turned them upside down (see "4"). The captain's assistants used the pair of thick, flat chopsticks that held the "orange flags" in place (i.e., the "mystery centerpieces" from the beginning of the night -- see photo from earlier), to rest the "orange flag" on the set of assembled prongs (see "5"). The "orange flag" was a flat, tomato pasta. Next, they put a chunk of braised short rib meat (see "6")--you know, the kind that falls right off the bone--and asked us to place whatever "toppings" (see "1") we'd like on top. Once we did this, they instructed us to enclose it, like a ravioli-dumpling (see "7"). This was probably my #1 favorite overall (the maitake was a close contender, though). I love that we were able to "play" with our food here, and again, the presentation and atypical "dinnerware" were another marveling surprise--very clever and brilliant. Tfhe short rib was braised thoroughly for a tender, hearty texture, and the enveloping tomato pasta was soft and flavorful. The addition of the miscellaneous "toppings" brought out the ingredients of the short rib and the tomato from the ravioli. Another interesting point is that the "centerpieces" don't go unused at Alinea--they become a part of the entire meal (the rosemary will be seen later)! 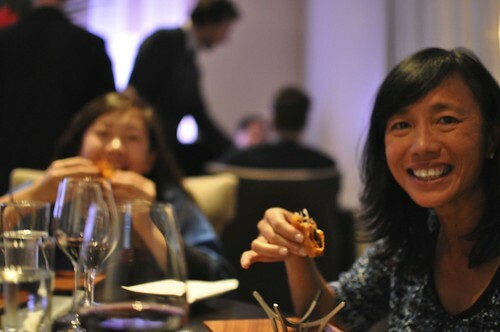 Kai Ma, enjoying her personally handmade short rib ravioli-dumpling, along with Laura, chowing down in the background. 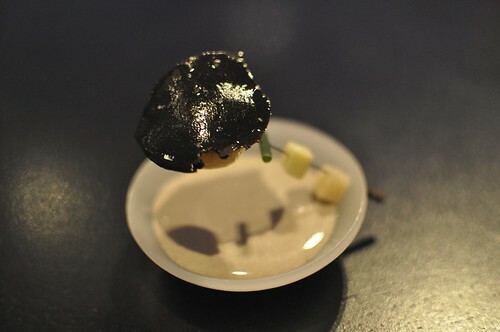 The following course was the hot potato with cold potato (i.e., chilled potato soup), black truffle, and butter. We were told this was a very time sensitive dish, so we had to drink it all in one shot: once we pulled the metal toothpick down and out, the contents (i.e., the black truffle and hot potato below it) were to fall into the chilled potato soup. The bowl was made from wax, which we used to drink the contents. The infusion of hot and cold along with the refined pungence of the black truffle sent an umami (Japanese for "good taste or flavor"--also known as the "fifth" taste of "savoriness") wave over our taste buds--the starchiness of the potatoes absorbed the flavor of the black truffle very nicely and evenly. This main course was the pigeonneau (i.e., French for "squab") à la Saint-Clair, served on vintage, antique-y dishes to emphasize the "period" preparation of the squab. The cooking style, à la Saint-Clair, is an ode to a French gastronome August Escoffier, who was an early proponent of the use of squab in French cuisine (thank you, kevinEats, for refreshing my memory of Chef Achatz's philosophy behind this dish). In Le Guide Culinaire, his main contribution for updating and "tweaking" French cuisine, Escoffier had several "recipes" and "techniques" for the best ways of preparing squab (i.e., young pigeon), and this dish prepared by Chef Achatz is one of those ways. The preparation of the squab (more detail here with Mark Bernstein) is somewhat challenging in that it is in fact a smaller bird, where the breast meat tends to be overdone before the legs are even at that point. For this reason, Chef Achatz prepares each portion separately, as seen above, to maximize the texture and flavor for all parts of the squab without overcooking. 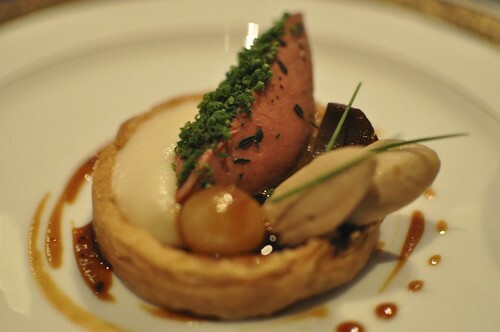 So for this course, the poached squab is served over a tart puff pastry with mushrooms, mousse of foie gras, onion, and parsnips. This was probably the most savory of all the courses with the squab perfectly poached with the assorted vegetables and richness of the foie gras complementing it precisely. I think what really struck me about this dish was not only the preparation and the history behind it, but the reason why Chef Achatz decided to insert such an interlude of a course within a very forward-thinking tasting menu. It is his way of showing off his ability to execute the complexities behind fine, classic French cuisine (as he did so during his tenure at The French Laundry). Very cheeky and quick-witted--kudos to the chef! 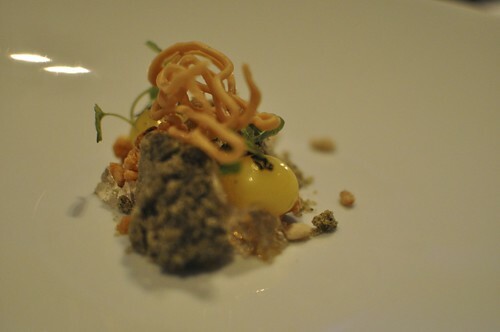 A signature Chef Achatz dish, this next course was the black truffle explosion with romaine and parmesan. 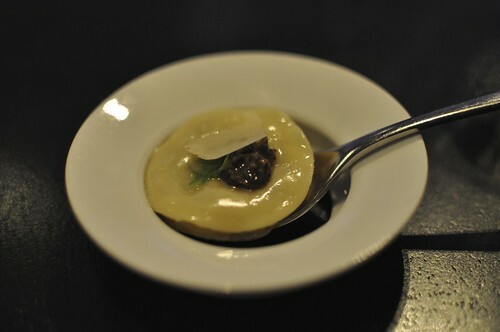 A raviolo delicately filled with truffle stock, topped with a slice of black truffle, romaine lettuce, and a sprinkle of parmesan, we were told to take this in one bite. The explosion followed immediately after, where the rush of umami recurred here, too. For any kitchen, you can never go wrong with impressing your guests with the tang of umami. Kai Ma and my mom said this reminded them of Shanghainese soup-filled dumplings (i.e., xiao long bao). All that was missing was a meaty interior and a splash of red vinegar. Nevertheless, we really enjoyed this course. Served on an unusually-shaped sizzling hot plate (second photo), this course is the lamb with red cabbage (back piece), peach (middle piece), and rosemary aroma. Excuse my out-of-focus photos--we were told it was a "time sensitive" course (i.e., temperature related) so I took these photos as fast as possible. 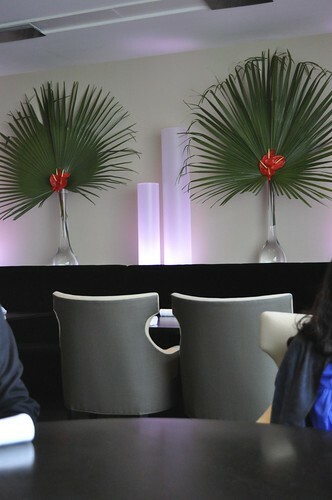 As you can see, they also used the rosemary holders placed on our tables as chopstick holders (first photo), then placed the actual rosemary into a designated spot on the hot plate for the course's aromatic effect (third and fourth photos). I liked the bite-size portions and the concentrated flavor of the peach and red cabbage. I think I may have waited too long (damn time used for photo taking!) that the lamb may have been more medium-well than medium. Otherwise, the rosemary flavor was very pervasive, and the lamb nearly tasted like there was actual rosemary with the lamb. The next three courses were served concurrently. The first (on the left) was the pineapple with freeze-dried cherry (the transparent portion mixed with pineapple) and country ham (sprinkled in powder form on freeze-dried cherry). The overall taste reminded me of the toppings typically found on Hawaiian pizza. 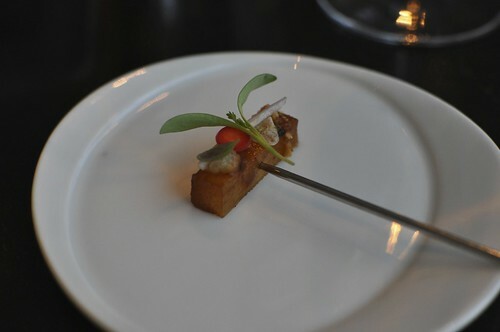 This was served between a rocking stainless steel clip that you'd hold and unclip accordingly. Savory and tangy simultaneously--nice intermission between entrées and dessert. 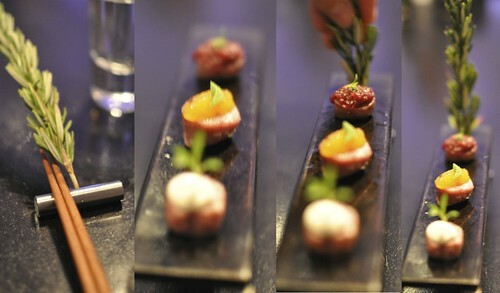 The second (in the middle) was the bacon with butterscotch, apple, and thyme, served on a suspended wire rocking contraption. The bacon tasted as it sounded--sweet glazed with some thyme. Presentation was definitely the strong-suit for this course. The last (on the right) was the liquefied caramel popcorn. All of us at the table were saying how this seemed like something outside of the television cartoon, The Jetsons--food no longer appearing as "food" but in pill- or liquid-form (as seen here). Very innovative--tasted just like caramel popcorn without the nuisance of kernel shells. Shortly after, the captain asked if any of us would like to finish the evening with a cup of tea or coffee, so I asked if I could have a cup of Earl Grey. She said that Alinea does not offer Earl Grey tea on the beverage menu because of the course on the tasting menu that is focused on Earl Grey as its main ingredient. I'm not gonna lie--I was a bit let down. Earl Grey has always been my tea of choice, and now I couldn't have it because the chef didn't want any thunder stolen from one of his last courses. Fortunately, the letdown didn't last too long--Alinea won me back almost in an instant with thise next course, which was the Earl Grey with lemon, pine nut, and caramelized white chocolate. The whole dish rested on an air-filled pillow (see in group photo below), which continued to collapse with the weight of the plate and its contents, releasing an Earl Grey-scented aroma to enhance what would have been our mono-sensory experience of tasting the contents on the plate to the dimension of a multi-sensory dining experience (very similar to the aromatics of the autumnal vapor for the maitake and burning leaves of the pheasant). Along with the maitake and the short rib courses, this one ranks up there for us, too. The texture of the entire dessert was very delicate, which isn't to say the kitchen skimped on flavors and tastes--this certainly was not the case. Even as someone who isn't particularly fond of white chocolate (I'll always prefer dark), it shocked me how much I enjoyed the caramelized version that was featured in this course. It was as if the ingredients used were things that go well with tea--the "milk" as the white chocolate, the lemon as itself, and the pine nuts as something complimenting the tea. Beautiful execution--definitely my favorite "aroma" from the tasting menu. Mom, Kai Yeh, Laura, Kai Ma, and me with our Earl Grey dessert and pillows. The next dessert dish was the bubble gum "cocktail tube" with hibiscus gel infused with long pepper (on the left), crème fraîche (middle), and a bubble tea (right) made with tapioca pearls and Bubble Yum. We had to "drink/eat" this in one "pull". This was another fun dish that reminded me of bubble tea (those flavored teas with a long, thick straw to fish out the black tapioca pearls bobbing at the bottom), only bubble gum flavored. The tube part of the dish seems like the type of straw that typically come with bubble teas. As seen in the many of the above courses, Chef Achatz seems to use a basic element of a dish or ingredient and encapsulate the surrounding ingredients into this said element or original environment (e.g., emulating maitake in its original habitat, incorporating Jack Rose apple cocktail flavors in solid form, creating the aroma of burning leaves for the pheasant), which makes for a very thorough history and thought behind those courses. Kai Ma's complimentary birthday dessert--melting chocolate and crème! 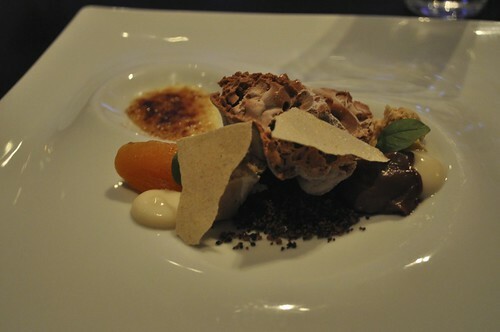 As the last course of the tasting menu, this was the chocolate mousse (set in liquid nitrogen) with apricot (seen as the orange), honey brûlée (seen in the back, with the torched surface), and peanut nougat (topping the mousse). The nougat was light in texture and rich in peanut flavor, an unusual (but complimenting) combination with the different textures of the mousse (smooth and creamy) and the brûlée (hard surface, custardy interior). With these three "dessert" type items combined into one course, the sweetness of the dish was not overdone as it was mostly subtle, for when the three were combined, it rendered the optimal sweetness. 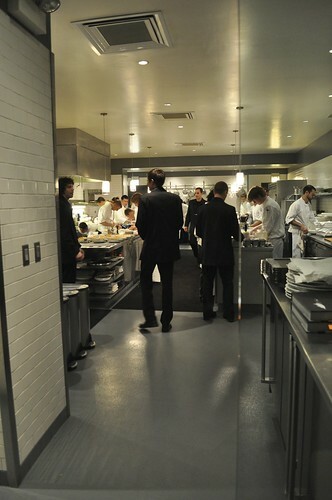 Inside the kitchen at Alinea--quiet and spotless. Unfortunately, as Chef Achatz pretty much "works the line" every night he's at the restaurant, it is hard for him to leave to greet and meet guests (we had already tried asking the captain to see if there was a possibility of meeting Chef Achatz). Not all was lost, though (see below). 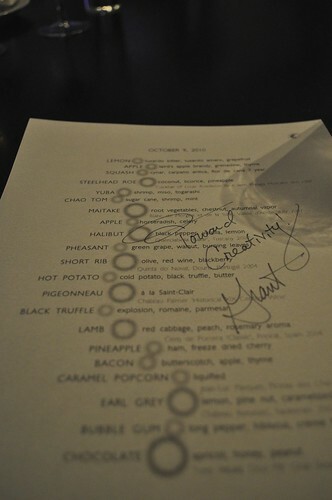 To my excitement, Chef Achatz graciously signed my menu, adding a little message: "Toward creativity!" How fitting :]! 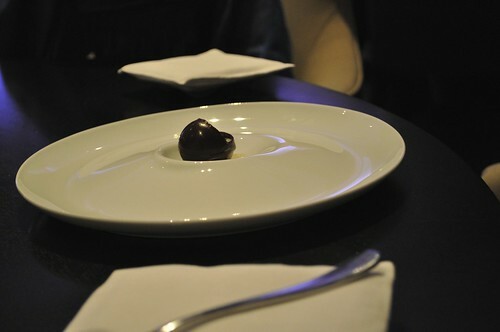 Findings: Let me reiterate the Tweet that I posted upon leaving Alinea that Saturday evening: Grant Achatz is a genius! I know I may sound like a pretentious food snob or an echo of token foodie talk, but it's not propaganda--it's the complete and utter truth. For a tasting menu so extensive and lengthy (it was composed of twenty-one meals, after all), there were no disappointing courses. Not one. The amount of vision, detail, and forethought as well as the level of technique, execution, and perfection is arguably unmatched. I have had my fair share of tasting menus (though nothing of this grandeur) in several fine dining establishments in Manhattan, and I haven't come across anything of this caliber on a culinary level. 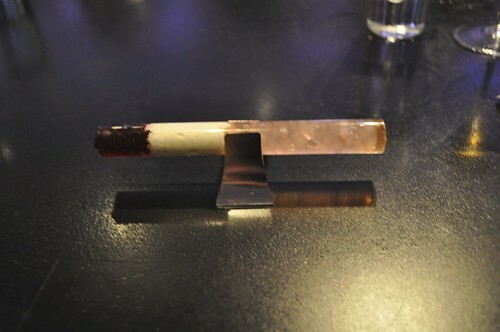 Chef Achatz's vision behind Alinea is forward thinking, constantly in motion, very dynamic. His kitchen laboratory is perpetually pushing the envelope to explore and discover new frontiers in taste, technique, and presentation (as evidenced in my photographs and descriptions above)--something I admire tremendously. Each and every course throughout the menu's progression contained some unexpected surprise (all good, of course) which added the extra dimension of playfulness to the entire experience -- in particular, the interactive nature of the dinner (i.e., having specific instructions as to how to eat each course for the restaurant's guests) as well as the multi-sensory thought behind each course (i.e., not limiting or relying on a guest's enjoyment of the dish solely through taste). I mean, when was the last time the chef encouraged you to "play" with your food? Anyway, I know the price point is pretty steep, but it was definitely worth every penny. It was so very hard for me to completely capture this wonderful meal in words, so please use my photographs and descriptions in this blog post as some consolation for my inability to fully express how moved I was by the entire experience at Alinea. Nevertheless, I'm incredibly glad I was able to experience the single best meal in my life (I have no qualms saying such a thing) with my mom and my kai family, especially as a prelude to celebrating Kai Ma's 50th birthday with such an elegant, impressive, and totally mind-blowing meal. All fortuitous omens, countless culinary delights, lovely presentations, no disappointments, and great company. Can't ask for more than that. Also, just a big, big thank you to my Kai Yeh for taking us all out that night! Price point: $195 per person for the 21-course fall tasting menu. Saw this and thought of you. For the holiday wish list perhaps? Thank you for the wonderful write-up. Anytime we can be a part of such a wonderful family celebration makes us warmly gratified in our work. Happy birthday (belated) to Kai Ma from the entire Alinea family. Thanks for the kind words, Nick--hope to revisit Alinea very soon for another wonderful dinner! What an incredible piece - I feel like I was dining right along side of you. Thanks for sharing with us! I can't wait until I have an opportunity to dine there, and you've made the prospect that much more exciting!